Glazing a shower pan is a great way to breathe new life into an old shower. Over time, shower pans collect scuffs, cracks and chips. These marks are not only unattractive, but they make the shower pan different to clean. A new glaze will fix any imperfections, but it can do much more. Use a colored glaze to change the color of the shower pan. Or, use an anti-slip glaze to make your shower a safer place to get clean. Bring new life to an old shower pan with a coat of glaze. Remove the drain. Unscrew the screws that hold it in place. Pull the drain strainer up. Grip the edge of the strainer body with a pair of pliers and twist it free. Place the drain strainer, strainer body and screws in a plastic bag for safekeeping. Scrape the old caulk surrounding the shower pan away with a screwdriver. Sand the shower pan with extra-fine grade sandpaper. Scuff the surface just enough to remove the gloss on the fiberglass. Sweep or vacuum up the sanding dust. Try not to sweep any sanding dust into the drain hole. Look for any still-glossy areas that you may have missed. Re-sand if necessary. Wipe the area clean with a sanding cloth when you're done to remove any remaining sanding dust. 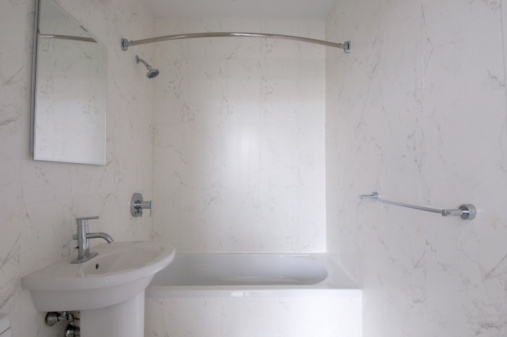 Wipe the surface of the shower pan clean with a rag moistened with acetone. Prepare the room. Apply painter's tape around the edge of the shower pan. Lay a drop cloth in front of the shower. Open a window. Place a fan in front of the door to increase air circulation. Apply the glaze via a paint sprayer according to the glaze's instructions. Allow the glaze to cure for the amount of time listed by the manufacturer. This is often anywhere from 24 to 72 hours. 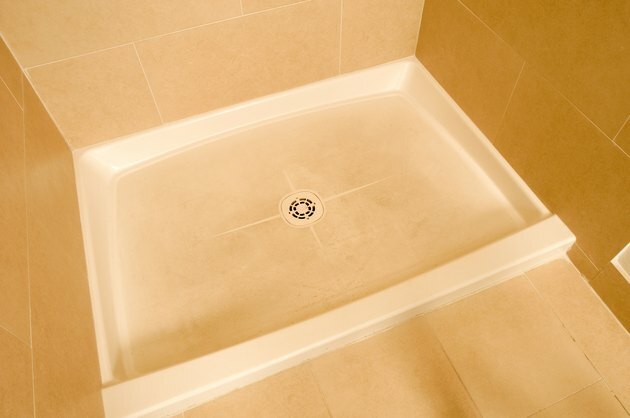 Remove the painter's tape, replace the drain and re-caulk the shower pan.